"The Multiple Sclerosis International Foundation estimates that over 2.5 million people worldwide have multiple sclerosis. Throughout developed countries, increased attention has been paid to this disorder, due in large part to advanced imaging technology and the development of new therapeutic pharmaceutical agents. Multiple Sclerosis for the Practicing Neurologist, edited by Joel Oger, MD, and Adnan Al-Araji, MB, offers a practical review of this disabling condition, especially focused on the evaluation and treatment of patients in low-resource environments, which lack these new technologies. It is the fifth volume in a series of clinically oriented titles developed under the auspices of the World Federation of Neurology. 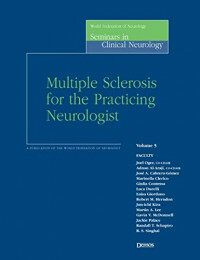 Multiple Sclerosis for the Practicing Neurologist is the first volume to address the issues faced by neurologists with limited resources who must deliver care to MS patients."